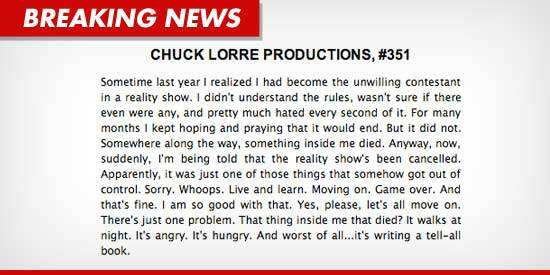 "Two and a Half Men" creator Chuck Lorre seems to be pretty pissed off about Charlie Sheen's plan to pen a tell-all book ... and last night, Lorre once again used a "Vanity Card" to rip the Warlock. The Vanity Card -- a slate written by Lorre -- appeared on screen at the end of "Men" ... which now features Sheen's replacement Ashton Kutcher in the lead role. Lorre never mentions Sheen by name -- but it's pretty clear he's talking about his former sitcom star when he wrote, "Sometime last year I realized I had become the unwilling contestant in a reality show. I didn't understand the rules, wasn't sure if there even were any, and pretty much hated every second of it." He added, "Somewhere along the way, something inside me died. Anyway, now, suddenly, I'm being told that the reality show's been cancelled." "There's just one problem. That thing inside me that died? It walks at night. It's angry. It's hungry. And worst of all ... it's writing a tell-all book." As TMZ previously reported, Sheen was shopping around for a book deal earlier this year -- hoping to score $10 million. No word if he ever inked a deal.